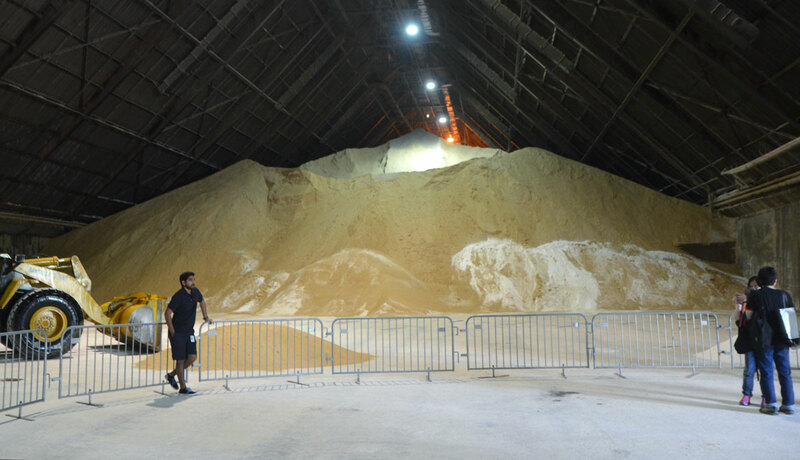 This is what 37,000 tons of raw sugar looks like. The Raw Sugar Shed at Redpath Sugar is 27m high, 155m long, and 43 m wide. It’s a big space! 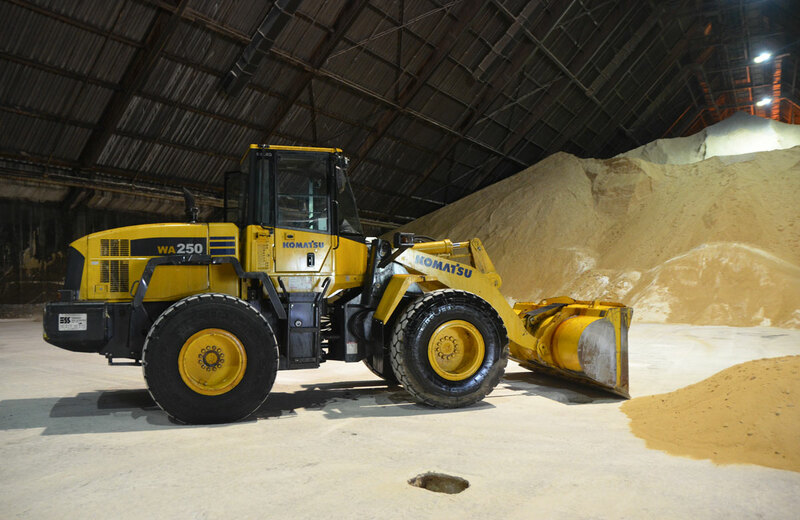 Raw sugar is brought to the Redpath Sugar facility by ship. When it is off-loaded from the ship it is brought into the warehouse by conveyor belts that run down the middle of the ceiling. below: There isn’t a ship in the harbour at the moment so the green crane waits. below: You can see a holes in the foreground of the next photo. This is one of many holes in the floor of the Raw Sugar Shed. The raw sugar is pushed through these holes to another series of conveyor belts below. 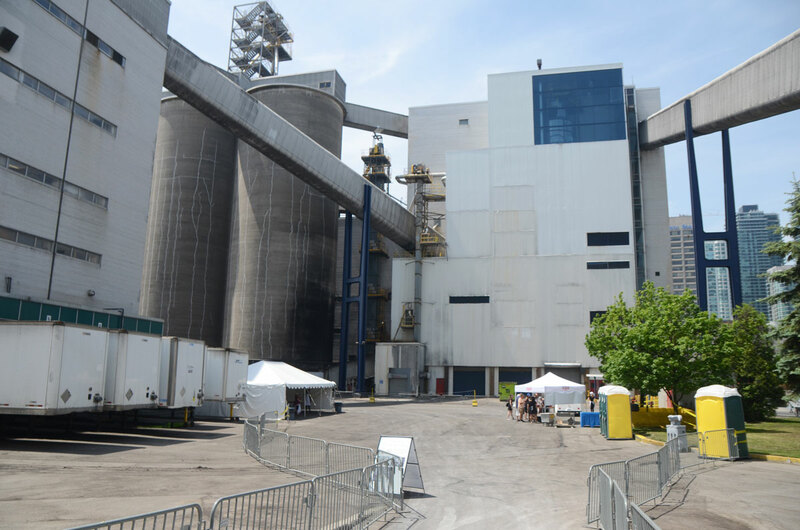 below: Photo taken from the entrance to the Raw Sugar Shed, taken at Doors Open. 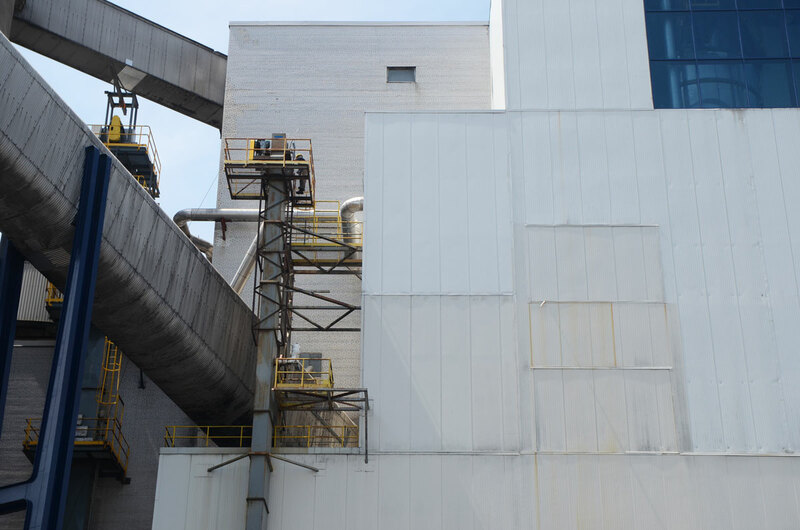 Raw sugar is taken by conveyor belt (upper far right) to the processing plant next door. 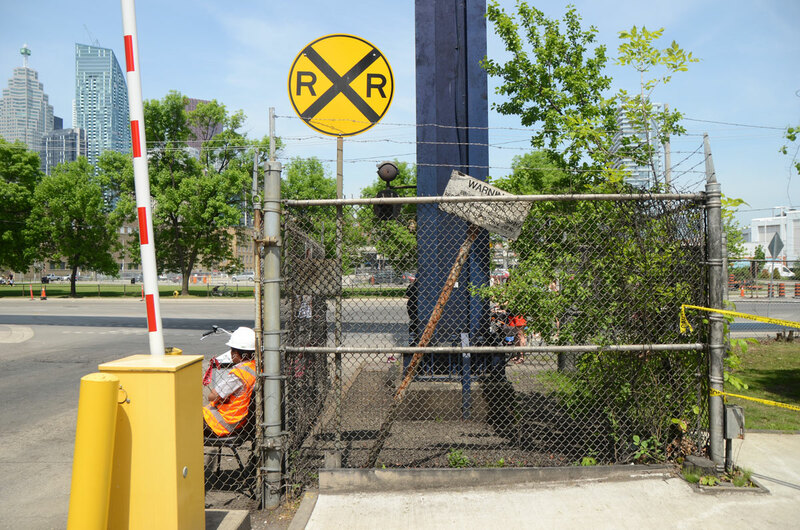 below: A lingering remnant, railway crossing signs from when a railway ran here. 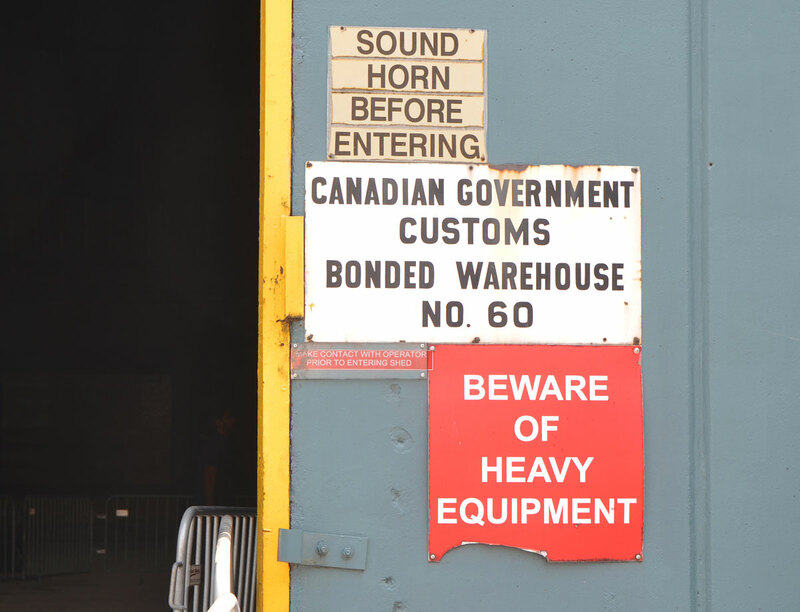 A guard sits by the entrance to Redpath Sugar. 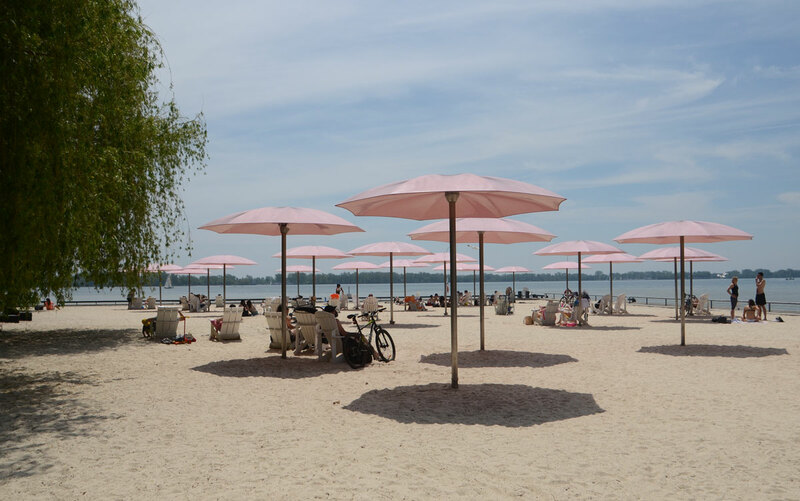 The railway serviced the industries that were built along the Toronto waterfront, The LBCO, Loblaws, the ‘Toronto Star’ newspaper, Molson Breweries, Dominion Malting and others, relied on the railways. 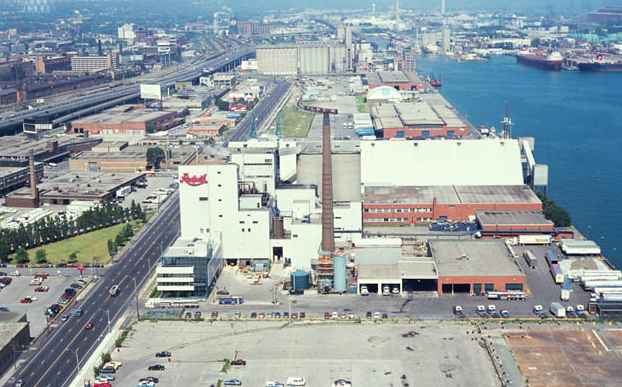 Completed in 1959, the Redpath refinery was the last industry built along the waterfront. You can just see the railway tracks in the photo below, running between Queens Quay East and the Redpath building where they dead end. Since the tracks only dead ended there in 1985, that helps date the picture. Rail service ended in 2008.
photo credit: Originally from City of Toronto Archives but found online at Old Time Trains. 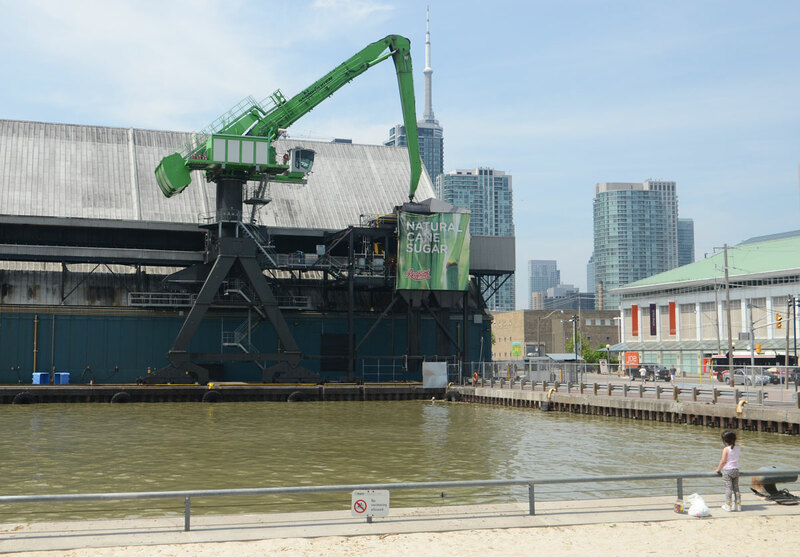 Today, Redpath Sugar is one of the last industries operating on the waterfront; The area around it is rapidly being redeveloped, including the space right next door that is aptly called Sugar Beach.